Fall is here, and this season’s Greenfox programs are off to a great start! Kids and teachers are back in school, which means school and after school programs are gearing up. Fall is a great time for everyone to get outside, go apple-picking, visit a pumpkin patch, or rake up the leave in your yard (and compost them)! In this newsletter, we hope to tell you about what we are up to at Greenfox this fall and to let you know what we have in store for the season. This September marked the start of Greenfox Schools’ 2011/12 school year programming. We expanded to five schools this year, providing classes at the Harrington, Haggerty, King/Amigos, Tobin, and Morse schools. We’ve recently finished our first week of instruction to great success! We have a diverse collection of age groups, grade levels, and learning abilities in our classes and we are excited to work with each and everyone. We have also brought on two new teaching interns this fall, Sarah Stickney and Karl Daruwala to assist in the classroom. Sarah is a long-time friend of Greenfox and has extensive experience both in the non-profit and education sectors. Karl is a Lesley University student focusing on Early Childhood Education and aims to bring his knowledge to the classroom. We are geared up for an exciting curriculum this fall that includes organic gardening, building recyclable inventions, and learning about wind power and the concept of an eco-friendly supply chain. Stay tuned in the coming weeks for more updates from the classroom! With the new season comes a great opportunity to make a change in your life that is good for you and the environment! Greenfox is encouraging all of our readers to set a green goal for your home, classroom, or office this fall. *Start an ink cartridge recycling program at your office. *Eliminate toxic chemicals in your classroom. Use only non-toxic, biodegradable cleaning products. *Compost at home. 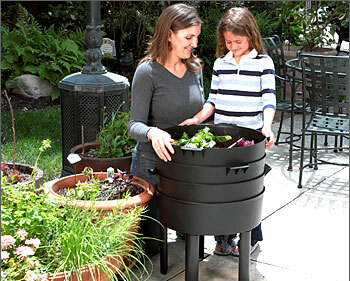 Start a vermi-compost bin in your kitchen or build a composter in your back yard. *Walk to work. Leave the car at home more often. *Bring your lunch in a re-usable bag every day. Let us know your goal! Send us a description and photos of your project and you may be featured in our next newsletter! We will also post goals and projects on the Greenfox Schools Facebook page. Greenfox Schools’ founder Kristen von Hoffmann is currently in the full-time role as sustainability manager for the Cambridge Public School District in Massachusetts. Superintendent Jeffrey Young has just announced a press release for the Cambridge Green School Initiative, which will be directed by Kristen, and which is based on the Greenfox5/PFEWG TM categories of change in the sustainability areas of Products, Food, Energy, Waste, and Greenspace. The initiative takes into account sustainable operations, design, and practice among all of our schools, and utilizes our new District website and weekly e-mails for up-to-date communications. The initiative is based upon the PFEWG™ model for sustainability that encompasses all operations in the categories of Products, Food, Energy, Waste, and Greenspace. Click here to read more. Thank you for taking the time to learn more about our organization and the projects currently underway. Don’t forget to let us know what you and your community are doing to make the world a greener, better place! You can always find out more about our latest projects and updates on our website and Facebook page. Thanks for reading!